In case you're looking for some new additions to your wardrobe that screams spring then check out the Shopbop sale that's going on right now. Use the code EVENT17 to get 20% if you spend under $500 or get 25% if you spend $500 or more. 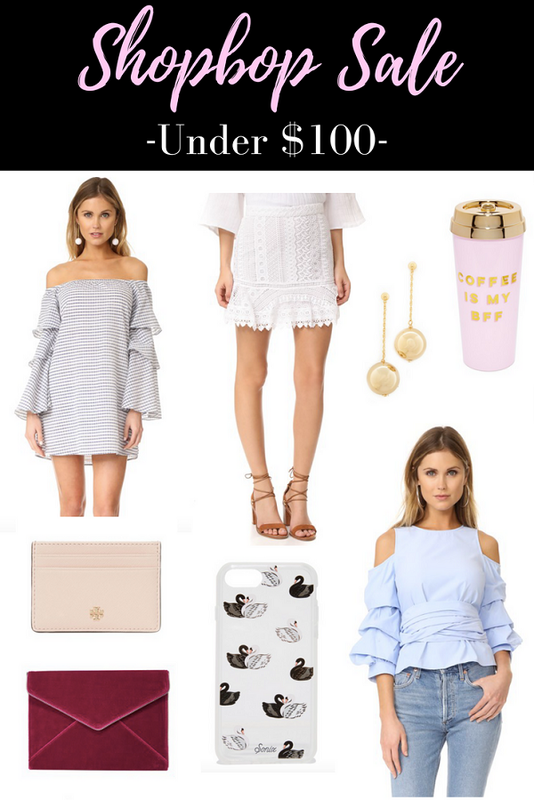 I decided to link some of my favorites that are under $100 since ya girl is broke and I'm sure other college girls out there don't want to spend a lot either haha. First up is that gorgeous striped ruffle dress that's perfect for any events that you have during the spring or summer. Also that white lace skirt, so gorgeous! Pair it with a chambray shirt for a casual look or dress it up with an off the shoulder top for date night. Also you guys need to check out that blue shirt cause it has a bow in the back and it's such a unique piece for your spring wardrobe. As for the accessiores, I'm going through an earrings phase right now and love long dangly earrings so I had to include those gold ones in there. Also that velvet Rebecca Minkoff clutch is perfect if you want to dress up any of your outfits and a great way to include velvet in your outfit for warmer days ahead. Lastly, I've always wanted a card case since I usually take a card with me wherever I go and don't want to take my whole wallet. And that phone case? Girl, I got an iPhone 7 a couple of months ago but can't find a nice case for it anywhere in stores so I have to order this black swan one especially because I have an obsession with swans!